Photoluminescent signs not only provide clear direction during daylight, but aid in emergency evacuations when the lights have gone out. Their glow-in-the-dark capability makes them an excellent choice for public and industrial locations where safety is a priority. Put your traffic signage on the floor where drivers and pedestrians will notice it with these vinyl, brightly colored, adhesive stop signs. Available in sizes from 16" x 16" to 54" x 54". Warn forklift drivers when they are over the speed limit for a specific area to help increase warehouse safety with radar activated LED signage and audible buzzer. Speed limits can be can be adjusted for any situation between 3 mph to 30 mph. Adding safety signs to your facility helps reduce workplace injuries while enhancing efficiency in the workplace. Clear messaging is always an operational plus as it makes workers more aware of their surroundings, more alert to hazards, and more effective in their jobs. Basic industrial safety signage aids workers in knowing what is happening around them, where hazards are and how to avoid them. They also help reduce the potential for injury and damage by informing and educating before an accident can happen. 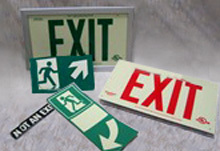 Photoluminescent signs aid in emergency situations where the lights have gone out and workers must evacuate the location. These softly glowing signs provide guidance and illuminate the egress pathway. Very effective for both public and industrial applications where emergency egress must be considered.